Ingredients: Mica, Talc, Ethylhexyl Palmitate, Silica, Nylon-12, PTFE, Zince Stearate, Dimethicone, Tocopheryl Acetate (Ve). Great colours, highly pigmented, blends well. I love that it doesn't have chunky glitter like the Milani baked blushes. Love! So pigmented, goes on super easy, going to purchase the dark palette too (and use with a light hand) The light is so good, I'm sure it would be good as well! Totally in love with this palette! I love the selection and colours! covers evenly and is a great value, Probably best for those summer months if you tend to get pasty in the winter as the colours can go on a bit bold. Great colour selection and the price is right! 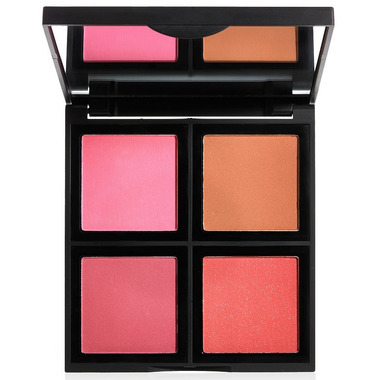 Great blush palette. Super pigmented and blends out evenly. Again great for the price.